A stream of audience is pouring into a great gash in the side of Bedlam. Unlike the waters of the North Atlantic, there’s nothing chilly about them – although it’s cold inside. Under the weight of expectation, the packed venue crackles with joyous anticipation. Sketch comedy is to theatre what frescos are to painting. The form can be subtle as Livia’s villa, boisterous as the Banqueting House, majestic as the US Capitol’s rotunda, daring as the Sistine Chapel – and of course it has to be funny. We enter to find white drapes framing the glow of a projector beneath which are a half dozen dining chairs and one green leather armchair. This will turn out to be a prop-lite production. The emphasis will be on the writing and performances. It is my companion’s first visit to Bedlam. Alex Harwood as Jim and Jodie Mitchell as Rosie made the perfect first impression. Disciplined, energetic, and gut-achingly well matched, the shame-faced romance between society girl and awkward oik is the turbocharged mechanism driving the script forward. Their material is cruder than the OPEC Reference Basket but it is beguilingly delivered with an (almost) untainted innocence. Other comic creations staple the scenes together – Jakey Rowling, the foul-mouthed children’s author, also played by Mitchell, and pseudo-psychic Poirot, played by the bloke who carries David Bard’s hair around, are among the more successful. And then, of course, there’s Lord Spygood, the ship’s captain. Spygood is as arrogant as Lord Flashheart, as deranged as The High Life’s Captain Duff, as anarchic as Sir Digby Chicken Caesar. He’s the plumb in the pudding, the plumbing that fills the boat with gravy. Andrew Blair inhabits the role like a glove. Is this Spygood’s The Dangerous Brothers phase – the unpolished period when Mayall and Edmondson first carved out the archetypes that would run them from The Young Ones through Filthy, Rich and Catflap to Bottom? Although an adequate vehicle for Harwood and Mitchell as well as Spygood, the script does not exactly hold together. Say what you will about James Cameron’s Titanic – that you hated it at the time, that it proved huge in Afghanistan, that you’ve kind of grown to like it – the one unsinkable truth about the 1997 classic is that it provides a clear narrative arc. They get on the boat. They ride around on the boat. The boat starts sinking. They try to get off the boat. They’re in the sea. The producers of Titanic 2 left so much deadwood in the lineup it’s a wonder anyone managed to drown for lack of something to float on. The result was that some seriously good material was dragged under and lost. Rather like when Crusoe and Friday fight off wolves in the Pyrenees during the final scenes of Defoe’s novel, the end to Titanic 2 is somewhat superfluous. With a concerted editorial effort to chuck some of the Jonah japes overboard this production would have enjoyed much smoother sailing. As it was, a wealth of time combined with a poverty of properties, lighting and sound effects saw the soufflé deflate into a cheesy mess. Chutney Exhibition prides itself on being an experimental incubator. There was not one idea in this production which did not deserve to come off the drawing board. Fewer, however, were ready for the transition from workshop to stage. Sketch comedy is like fresco painting, you can’t leave it so long that the plaster dries out entirely. It’s all about the timing. 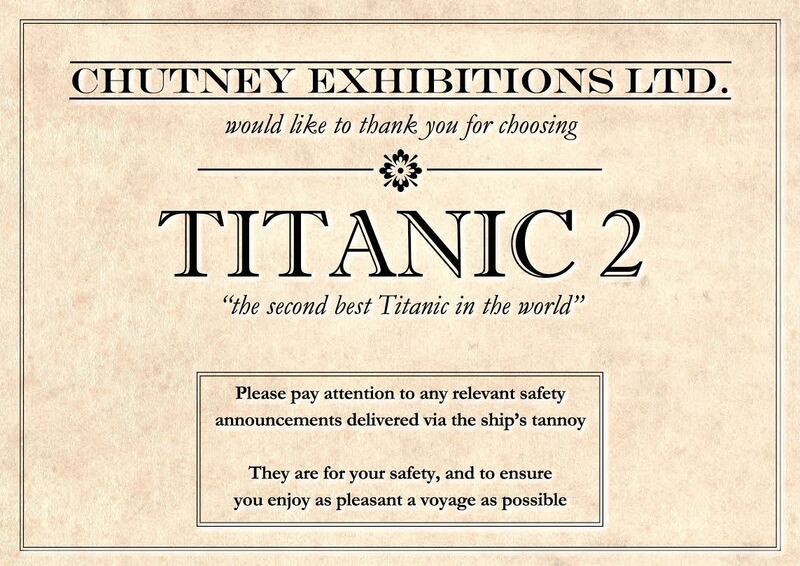 Visit Titanic 2‘s homepage here.